"By signing the agreement... we have really moved mountains," he stressed. 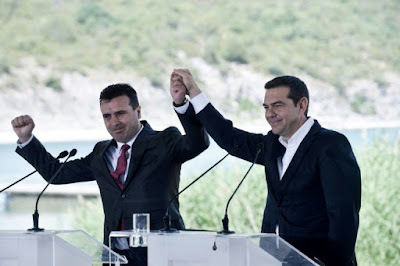 But as the two countries' foreign ministers signed the deal Greek protesters clashed with riot police, who beat them back with tear gas near the small village of Pisoderi, 25 kilometres (16 miles) away from the ceremony. Six policemen and six protesters were injured, police said, as around 500 demonstrators waving Greek flags tried to approach the signature ceremony. The accord aims to start unravelling one of the world's longest diplomatic disputes, which began 27 years ago with Macedonia's declaration of independence but whose roots date back centuries. On Sunday, some 5,000 people marched against the name deal in Bitola, in southwestern Macedonia, an event organised by the main opposition VMRO-DPMNE party. 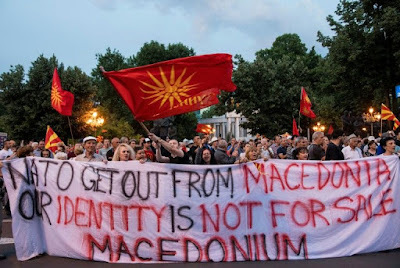 "Macedonia was hit by a hurricane today, and that hurricane has a name -- Zoran Zaev," VMRO-DPMNE leader Hristijan Mickoski told the crowd. He reiterated that his party would not support any constitutional bid to change the country's name. 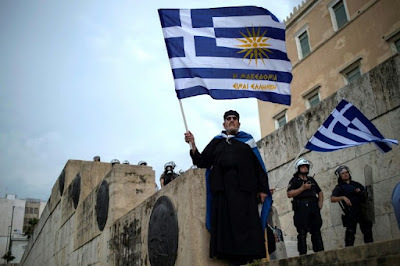 The one-hour protest held under slogan "Child North Macedonia -- Father Tsipras, Mother Zaev" ended peacefully.